Mental health in farming is not only a taboo subject in Britain, the stigma reaches across the globe to Australia too. With more and more time dedicated to highlighting the issue of mental health within the farming community, it is amazing to witness farmers tackling the subject globally too. What began as a joke has turned in to a social media phenomenon. Ben Brooksby, who lives on an arable farm in Wimmera, Western Victoria, Australia, took the bait from a friend and uploaded a picture of himself naked on-farm. The hype soon followed. Setting up an Instagram account aptly named ’The Naked Farmer’, he now has over 30,000 followers, but instead of using this success for pure humour, Ben decided to harness that popularity to put mental health firmly in the spotlight. Much like in Britain, depression and mental health within the agricultural industries still isn’t discussed enough in Australia. Ben, a fourth generation farmer and from the heart of a rural community, felt he could really make a difference by using the power of people. By getting farmers across the country to take similar snaps, Ben hopes to connect the public to farming and promotes mental wellbeing across all his accounts - and he’s just happy, he says, to be giving people something they can simply smile about. He has also seen first hand how depression can affect farming families and without there being any signs. "My friend and his family had just come home to their farm after a great holiday. "There was no drought and no struggles within their business yet his Dad took his own life and nobody really understood why. "The Naked Farmer has so many people right at its finger tips. I need to help - even if I save one life I’ve achieved my mission. "In Australia the suicide rate in farming is almost double than in any other industry which is a huge statistic. We need to try and make a difference. "I choose mental health purely because I know it’s such a huge issue and through The Naked Farmer, I think it can shed that stigma around talking about it and get people to smile and laugh at the images. "Even when a farmer takes a photo to send one in, it gives them a chance to stop and have a bit of fun. Nothing beats a farmers smile." He hopes to create a calendar to sell in 2019 to raise money for mental health charities. 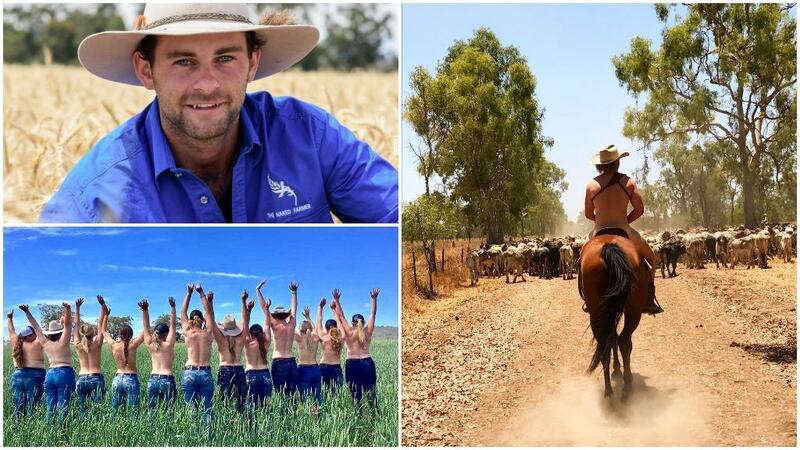 Ben will travel across Australia with Emma Cross, a photographer, where they will photograph farmers from different sectors and has set his sights on reaching $5,000. But what has the farming community had to say about The Naked Farmer? "I was playing tennis with someone who was a farmer himself. "He applauded how good the calendars were and it’s a great way to get people talking. "He talked about his difficulties with mental health and that day, we had a huge chat about it all. I like to believe it’s sparking conversations like this around Australia - around the world."